Grove Academy have been working in partnership with the HMS Frigate Unicorn for some time now and the work is going from strength to strength. Currently they are working together to provide an Inter Disciplinary Learning Project (IDL) for the second year pupils. The second year cohort rotate around several different projects over the course of the year that offer them a variety of learning experiences and introduce them to new ideas and collaborative opportunities. One of these rotations is to work with the Unicorn for six weeks and exploring Dundee’s booming tourist industry. 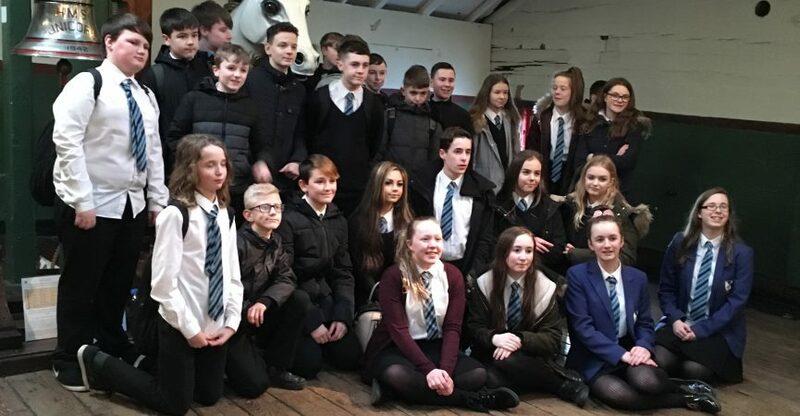 Two classes of second years, at a time, are invited onto the Unicorn and given a tour by Learning and Engagement Co-Ordinator Billy Rough who also explains some of the history of the 200-year-old ship and local landmark. Over the next six weeks the pupils are set a series of tasks all relating back to the Unicorn, which help them develop their employability skills. 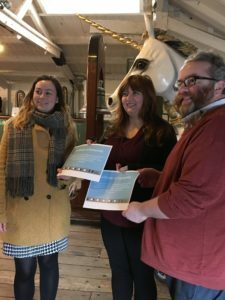 Design an information leaflet about the boat for tourists – creative and design elements, combined with history, research and literacy skills. Create audio tours for the boat (focusing on one or two specific stories per group) – creative and technology elements, combined with history, research and presentation skills. Create a concept for a visitors café (including designing, pricing and testing menus) – creative, design and catering elements, combined with budgeting, research and planning skills. All of the task are completed by each group within the six weeks. As well as helping develop skills specific to each task, taking part gives the pupils opportunities to work to a set brief and a deadline, as we as allowing them to develop their team working abilities, communication skills, and more. The pupils also gain an awareness of the local and national tourist industry. But most importantly the pupils have the opportunity to experience how what they are learning in school can be applied to the world of work, including the crossover between disciplines and the collaborative nature of roles. The pupils are also introduced to some of the many careers that are available to them. The benefits to the pupils are obvious, there are also benefits to Dundee and Angus as a whole. These pupils will be more aware and better prepared when they are ready to leave education. But there are also benefits for the Unicorn; along with a strong connection with their local community the Unicorn has permission to use the materials the pupils generate. There is likely to be an exhibition of all the pupils work at the end of the academic year and some of it may be incorporated into the Unicorn’s regular offer to tourists. If you are interested in taking part in any Developing the Young Workforce engagement, please don’t hesitate to get in contact with us.